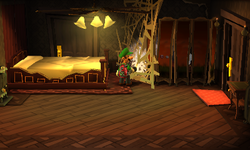 The Bedroom is a room in the Gloomy Manor in Luigi's Mansion: Dark Moon. This area is accessed by taking the middle door in the Master Hall. The Bedroom has a folding screen that Luigi can look into to see a gemstone. There is a stove and a closet with coats hanging, as well. The door on the north is a Trapdoor. Pulling on the cord near this door reveals a bed that Luigi can sit on to be taken to the Study. During A-2: Gear Up, Luigi needs to go to the Bedroom in order to go to the Study and take back one of the gears stolen by one of the Slammers. In A-5: Sticky Situation, the Bedroom is one of the rooms that is always covered in spider webs. Only on A-5: Sticky Situation, the player can use the hanging wad of spider webs on the ceiling fan to burn the web that is blocking the Mushroom Amethyst behind the folding screen. This page was last edited on May 1, 2017, at 21:05.